Over the past four or five decades, the feminist revolution has brought a lot of changes. There is a lot of evidence that the glass ceiling is being shattered. For one particular group, however, gender equity remains elusive. That group is working mothers. The problem of the "glass ceiling" has now turned into a related, from different problem: "the maternal wall." 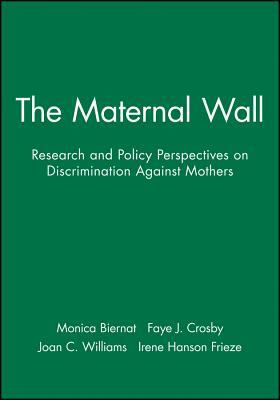 In the first Journal of Social Issues (JSI) to deal specifically with the topic of working mothers, scholars from several disciplines discuss a variety of aspects of the problem of the maternal wall. Monica Biernat is a professor of psychology at the University of Kansas. She earned her Ph.D. in psychology (social) at the University of Michigan in 1989. Her research examines the processes of stereotyping and prejudice, and focuses specifically on how stereotypes guide judgments of individual members of stereotyped groups. She is currently associate editor of the Journal of Personality and Social Psychology and was the 1998/1999 winner of the American Psychological Association Distinguished Scientific Award for Early Career Contribution to Psychology in the area of Social Psychology. Faye J. Crosby is a social psychologist who has specialized in issues of gender and justice. She is currently professor of psychology and head of the social psychology area at the University of California, Santa Cruz. Crosby is the founder of the Nag's Heart Conferences. In 1991-1992 she had the extraordinary privilege to serve as President of SPSSI. She is the recipient of numerous awards, including an honorary doctorate from Ball State University. Crosby has published widely on the present topic and many others. Her current focus is on affirmative action. Joan Williams, Professor of Law at American University, Washington College of Law, is the Director of the Program on WorkLife Law, and Co-Director of the Project on Attorney Retention. She is also author of Unbending Gender: Why Work and Family Conflict and What To Do About It (Oxford University Press, 1999).